BOSTON -- Signs marking the eastern and western ends of the longest continuous road in the U.S. were unveiled on both coasts Thursday. Historic U.S. Route 20 runs between Boston and Newport, Oregon. On Thursday, Massachusetts highway officials installed a mileage sign on the eastern end of the road in Boston’s Kenmore Square. 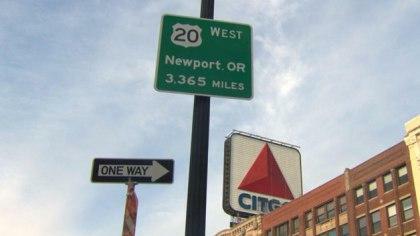 The sign will inform motorists that Newport, Oregon, is a mere 3,365 miles away on Route 20 westbound. A similar sign went up in Newport Thursday marking the same distance, 3,365 miles, to Boston should drivers want to travel the entire way eastbound on Route 20. The road passes through 12 states on its path between the Atlantic and Pacific Oceans.